Hurricane Sandy and Animals: some good news, and good advice. If you recall during Hurricane Katrina animals were NOT allowed on buses or other means of evacuation, or in shelters – which was appalling. New York City is not letting that happen! Animals can be brought to any evacuation shelter that is located in a public school; animals can also be brought on public transportation during an evacuation. Judy also gave us the link to The North Shore Animal League website which will keep us up to date on many aspects of animals and evacuations. These are the folks who go to the front lines whenever there is a disaster or emergency. What brave and loving people they are! BARCS needs help tomorrow morning. The shelter is located in a high flood area right along the water in Baltimore City. They will be evacuating all 200+ animals starting at 7 AM tomorrow morning. They are taking the animals to 1st Mariner Arena. If you can help transport, if you can donate crates, blankets, towels, and cleaning supplies, or if you can short term foster during the duration of the storm they can use your help (and can show them an evacuation plan). They need everyone there by 7 am Monday Morning. Please share and thank you! What’s gray-blue and stinking cute? DAPHNE! Our newest family member. If you read our newsletter regularly you’ll recall that our 18 year old Torti lost her brave battle and crossed The Rainbow Bridge early July. A month later we adopted a lovely tortoiseshell named Coco. But it turned out that Coco missed her foster mom as much as the foster mommie missed her. So, as believers in stories with happy endings and true love, we reunited Coco and Michele, and they are living happily ever after. 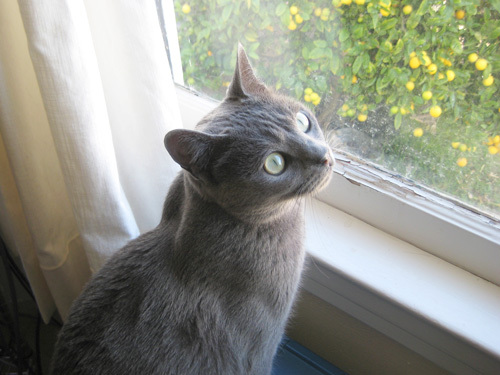 A few weeks later we met Daphne at San Francisco Animal Care and Control and knew she was the cat for us. 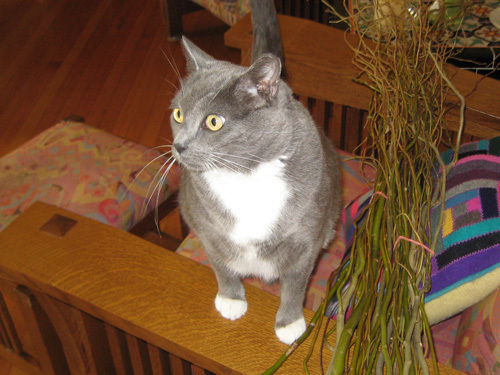 She’s stunning blue gray cat with features like both a Russian Blue and a Chartruex. 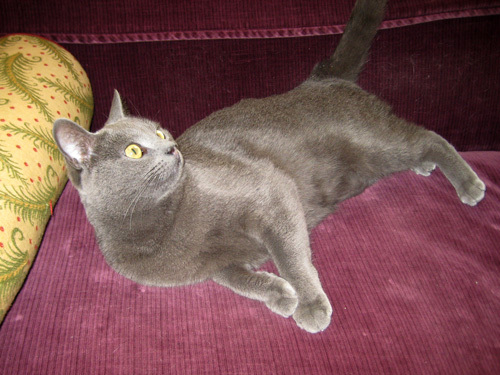 She has a tiny meow, that built in Chartreux smile, dense plushy fur, and bright green eyes. And the longest legs we’ve ever seen on a cat – we call them her Eiffel Tower Legs! Daphne took to her new home right away. She had no interest in hiding out in a closet, at all! Within hours of arriving she found all of Betty’s old favorite spots and claimed than as hers. 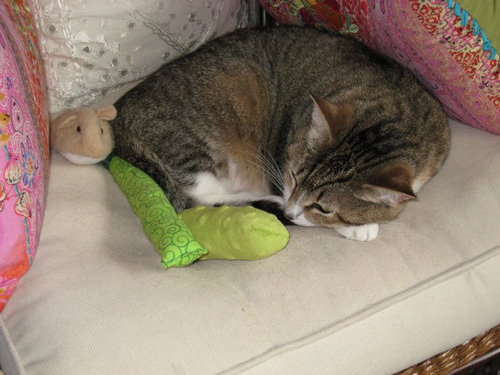 There has been very little hissing between Daphne and Madeline thanks to Comfort Zone For Cats with Feliway! We have two diffusers running in every room and we spray prominent objects in the house daily for a smooth transition and that “Hi, I like you” vibe! They also get Multi Cat Household flower essence in the water bowl. They aren’t buddies, yet, but we know that in time they will be, and that they will rule Cat Faeries side by side. Unbeknownst to anyone Daphne carries the Calicivirus. Five days after Daphne arrived at our house she broke out with the classic fiery red and angry looking oowie on her nose, and she had one lesion on her gum. Our house call vet, Dr. Brian Van Horn, raced over and swabbed her eyes, nose and mouth to test her for all the usual nasty things a cat could get. It was confirmed: calicivirus. Instinctively we knew that she needed Colloidal Defense, and this was supported by our holistic vet, Dr. Cheryl Schwartz. One dropper of Colloidal Defense mixed into her food, twice a day, kicked the virus to the curb in about two and a half days! That scary looking red thing on her nose started to clear and heal immediately. We’d been talking about adding this wonderful product to Cat Faeries offerings for several years, and with Daphne’s success story with it we sprang into action, and it’s now on our website. Madeline has obviously been exposed to the calicivirus so Colloidal Defense will be a forever supplement for both cats. Here I am! I see birds! Lot’s of pretty birds! That’s me, Daphne, relaxing after a long, hard day of work at Cat Faeries. What’s my job? Ambassador of Cute! Here’s Madeline inspecting fresh willow branches fresh from the farmer’s market. We give them to our bunnies to chew on. Do you care for ferals or know of abandoned outside cats who would benefit from a safe and dry place to sleep? 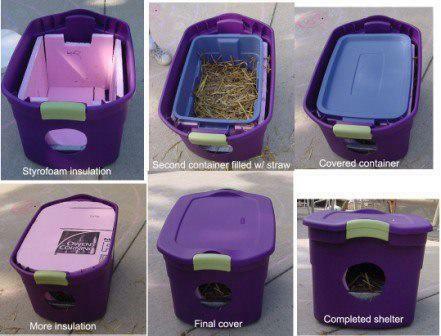 Using a storage bin, straw and Styrofoam building insulation, follow the photos and create a rain proof shelter for outside cats. Photos are by the Humane Society of Hobart, Indiana. Thank you Jenni for finding this! What to do with old litter boxes – clever ideas from our readers! We are big on urging people to replace litter boxes annually for two big reasons. No matter how much you scoop and clean, even use Anti Icky Poo cleaner once or twice a month to help with litter odor control they still get stinky after awhile and this can bother the cat. And goodness knows we don’t want to do anything to cause a cat to develop “litter box aversion.” Another plus to replacing boxes annually, we help to ensure a nice neutral smelling home for all who enter it. But, we also detest land fill and waste. So what to do with those old litter boxes? We posed this question to our Face Book fans and here are the replies. If you have a clever idea, email us and we’ll include it in a future newsletter. Please put “uses for old litter boxes” in the subject line. Is your cat staring at a heater grate or urinating on or near it? We may know why! It’s beginning to get chilly outside in some parts of the country. And when it’s cold outside mice want to come into our houses for warmth. So if your cat is suddenly staring at the heater grates or have even peed on it, mice who use the ducts as a highway could be the cause! Anti Icky Poo cleaner is safe to use near or on a heater. And it will get rid of the urine and the urine smell. Just shut off the heater before you apply it. Don’t use Feliway spray near the heater vent as it is flammable. Instead place a diffuser nearby. If there isn’t an electrical outlet there, use an extension cord and put a pea sized piece of Museum Wax under the pheromone bottle and attach it to the floor or a table.